The Square Cafe is bright, colorful, and packed within the inch of its life. The seating is what I would call “comfortably close.” You’re not elbow to elbow with other tables, but you’re about as close as you can get without crossing that line. As someone who doesn’t mind catching the sights and scents of fellow visitors’ food choices, I’m not really one to argue, but if you’re someone who likes a lot of space in their dining experience, you might want to plan your visit outside of peak hours. However packed the dining room, I immediately took to the layout of the place. The majority of the room is table seating, with a large counter lining the left side for both counter seating and to-go orders. In the corner by the counter is a little stand of merchandise. The bright hues of the walls are downplayed nicely by the pseudo-retro tables and chairs in black. After our friendly server gave us the specials of the day, we ordered coffee and were given a few minutes to look over the menu. The menu is strictly breakfast and lunch, but you can get either at any point during operating hours, always a plus when you’re like me and you usually want breakfast on weekends, but don’t feel like getting up/eating it at “traditional” breakfast hours. I had been lured by the veg options, but one of the specials was really calling out to me: An omelet with spinach, prosciutto, and goat cheese. Look, I’m not a religious person. But if there is a God, and he likes omelets, then he must dine at the Square Cafe regularly. It was one of the most terrific omelets I ever had. The egg was fluffy and flavorful and was neither too runny or underdone nor overcooked and spongey. It was well flipped, but not perfect, so that a little filling spilled out of it from the ends and sides. And the filling, the filling! Perfectly proportional to the amount of egg. The goat cheese was just present enough to bring into each bite but not enough that its flavor overwhelmed the other ingredients. The prosciutto was lightly cooked and worked especially well with the spinach, which was very fresh, light sauteed but still crisp. The omelet itself made for a formidable breakfast, but it came accompanied by a large serving of fried potatoes and two thick slices of ciabatta bread. The potatoes were very decent, fried and crispy and lightly seasoned. I wasn’t in love with them like Maureen and Brandon were, but I might have just been on a taste overload from the omelet. The bread was a welcome touch – I love ciabatta – but I could hardly touch it once the omelet and most of the potatoes were gone. Maureen also took a visit to omelet town and ordered a Omelet Ranchero, topped with a salsa that was mild, but had just the tiniest touch of spice. Anyone who loves Southwestern cooking knows that salsa and eggs are a perfect combination, and the Square Cafe did the pair justice. Again, the filling was almost perfectly proportional to egg, with diced ham and cheddar cheese in every tasty bite. My only reservation about the dish would have been the minimal ingredients. Without the salsa, there wasn’t much to distinguish this from a ham and cheese omelet. A little fresh green pepper would have pushed this from good to excellent. 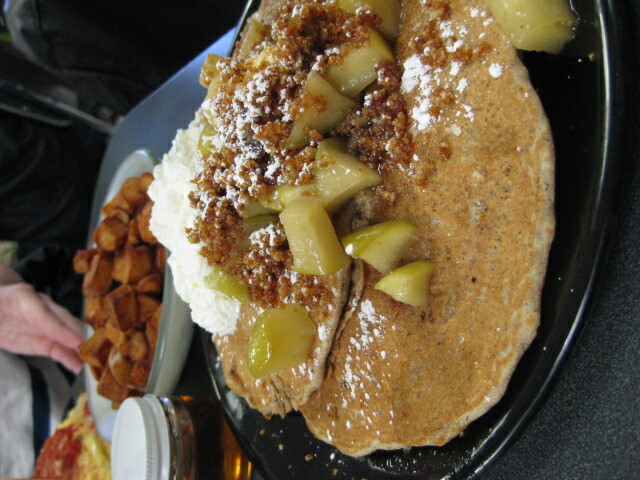 Brandon deviated from our egg-fixation and went instead for multigrain pancakes with warm diced apples and a crumbled pecan topping. They looked good enough for breakfast or dessert, but weren’t so sweet as to cross the line. As pancakes go, these were pretty top-notch: A little uneven, something always nice to see in a restaurant because those perfect pancake circles can get pretty generic. These were also a nice middle point between thick and fluffy and thin and crispy. The outside had a nice resistance, but inside was soft and subtly sweet. But can I address the praline pecan topping yet again? Cause it was heavenly. I want to eat it on all things: Pancakes, waffles, cupcakes, cookies, peanut butter sandwiches, scones…. And with the apple topping… I mean, the pancakes would have had to be dreadful to ruin the goodwill afforded by the delicious topping. I don’t know if Brandon knew what he was getting into when he ordered this dish, but despite the glorious mound of food in front of him, he finished every bite. If that’s not a high compliment to the food, I don’t know what is. 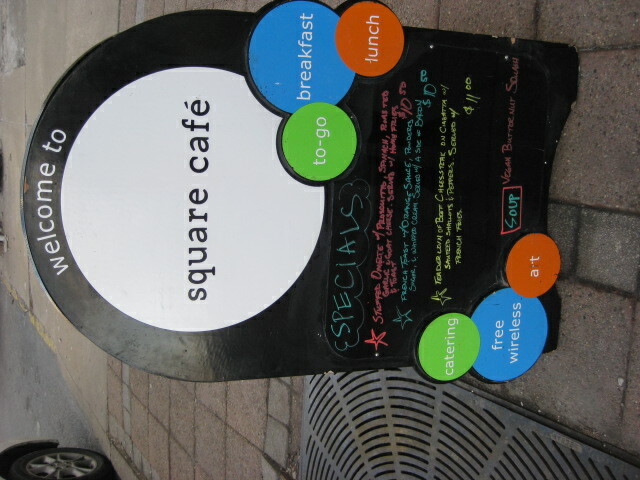 Our visit to Square Cafe was just about everything you could hope for from a breakfast: The food was delicious and satisfying and even a little inventive. The service was quick and friendly. 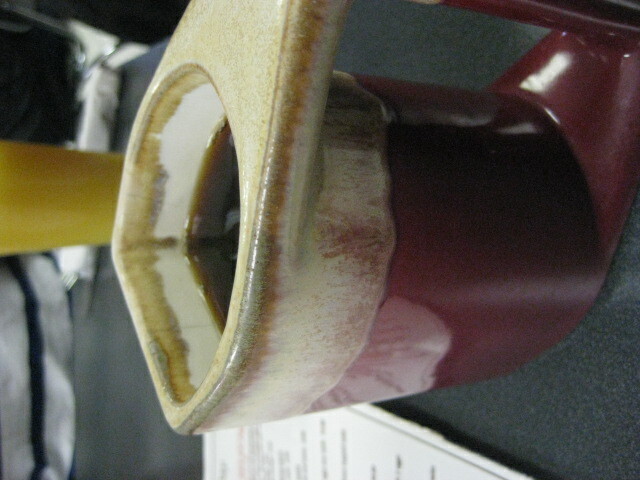 We were never in want of coffee in our cups or napkins or anything else we could have asked for. We ate and ate and stuffed ourselves silly, then we sat back to finish our coffee and chat for a while, and despite the packed house and consistent amount of incoming traffic, we were never rushed or even nudged to continue our conversation away from the table. As for some reported quibbles regarding price, I’m of the mindset that you get what you pay for, and here you get a great meal at a decent, if not completely inexpensive, price. I didn’t find the price to be all that higher than local favorites like the Dor-Stop or Pamela’s, and the dishes were as big and tasty as anything you could get elsewhere. But I’ll gladly add a dollar onto my dish if it means that vegetarians and vegans have yet another place to dine, cause, despite several quality options, it’s still too rare in Pittsburgh. This entry was posted in Dining Out, Food and tagged breakfast, brunch, cafe, coffee, diner, dining, dining out, east end, food, local, local dining, lunch, pancakes, pittsburgh, pittsburgh restaurants, regent square, Restaurant, review, south braddock, south braddock avenue, soy chorizo, square cafe, swissvale, tofu, vegan, vegan friendly, vegetarian, vegetarian friendly. Bookmark the permalink. I have been wanting to try this place for the longest time, but we never seem to make it there. It’s far enough away that we never want to drive there just for breakfast/lunch. 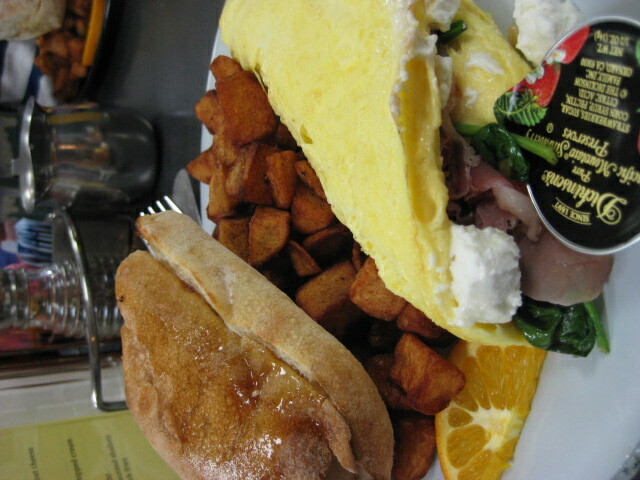 But oh my gosh that omelet you had sounds sooooo good it might be worth it to drive there just for breakfast! 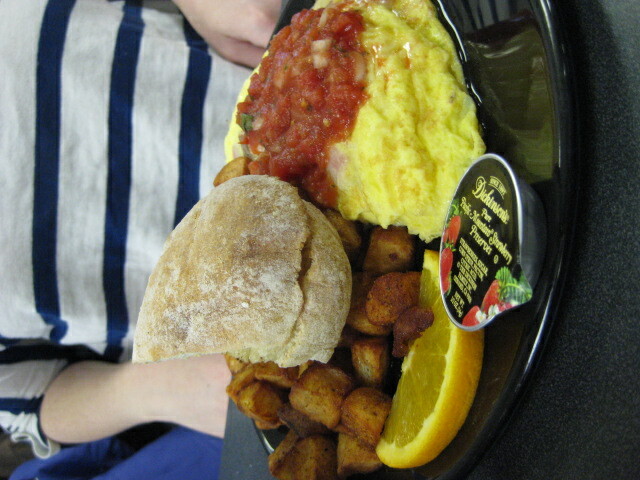 My favorite is the veggie overload omelet but last week I tried the hopple popple and loved it! Ain’t no ticket don’t take it… Wish we had a square cafe in Cali! I used to work here and it was A to the MAZING… I miss it. Sherree is the best! Pingback: Chicago: Day One | Forked!